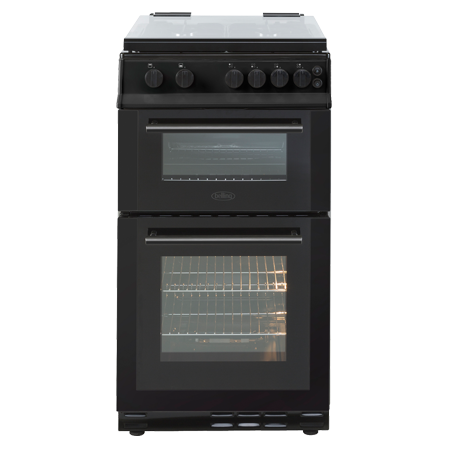 Removable Inner Door Glass : The oven doors are designed with a removable slide out glass panel, this gives you easy access to all parts of the door when cleaning, helping you make sure your Belling stays in mint condition. Open Door Grilling : This allows the air to circulate, so the food truly grills, and does not bake. Conventional Gas Oven : Preheat is essential in conventional ovens. Using natural convection, the oven cavity will be hotter at the top and cooler at the bottom, which is ideal for traditional roasting. The meat can be placed in the middle of the oven, roast potatoes towards the top, and puddings towards the base. Pay an initial 10% Deposit of £38.00. A £29 settlement fee is payable at the time of final payment. Settle the balance in 12 months interest free. Electric Cooker with Ceramic Hob - Graph..
60cm Electric Cooker with Ceramic Hob - ..
50cm freestanding electric cooker with t..